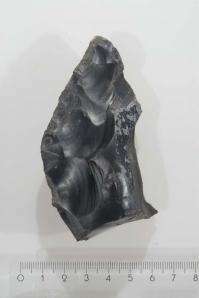 Finds from early stone age site in north-central Germany show that human ingenuity is nothing new – and was probably shared by now-extinct species of humans. Archeologists from the University of Tübingen have found eight extremely well-preserved spears – an astonishing 300,000 years old, making them the oldest known weapons anywhere. The spears and other artifacts as well as animal remains found at the site demonstrate that their users were highly skilled craftsmen and hunters, well adapted to their environment – with a capacity for abstract thought and complex planning comparable to our own. It is likely that they were members of the species homo heidelbergensis, although no human remains have yet been found at the site. The bones of large mammals – elephants, rhinoceroses, horses and lions – as well as the remains of amphibians, reptiles, shells and even beetles have been preserved in the brown coal. Pines, firs, and black alder trees are preserved complete with pine cones, as have the leaves, pollen and seeds of surrounding flora. Until the mining started 30 years ago, these finds were below the water table. The archeologists say they are now carrying out "underwater archaeology without the water." Work continues almost all year round, and every day there is something new to document and recover. Some of the most important finds of the past three years have been remains of a water buffalo in the context of human habitation, an almost completely preserved aurochs (one of the oldest in central Europe), and several concentrations of stone artifacts, bones and wood. They allow the scientists to examine an entire landscape instead of just one site. That makes Schöningen an exciting location and global reference point not just for archaeology, but also for quaternary ecology and climate research. A research center and museum, the "Paläon," is to be opened in 2013 to to provide information to the public about the work going on in Schöningen. I read these stories and they can be informative and interesting. The one thing I always wondered about was the dating of the artifacts that they find. Especially when it is inorganic in nature. I kinda sorta almost understand carbon dating, but what if there is just a spear head? Besides the specific layer that it is found in, is there a way to determine the date, like with a something like carbon dating but for non organic material like a stone? Anything older than 50,000 years is dated by other radiometric dating techniques. Uranium-series dating in this case I suspect. Looking at the stone tip, after reading promising news about nuclear fusion makes me contemplate how far our species has come. Let's not screw it up with people who like to riot over Muhammad videos, or others like them. @ tk1: Dating is, it seems to me, a long series [sic!] of interleaved methods. Already Darwin could date sediments accurately by considering deposition rates. Layerings were dated relationally if not often absolute. (I.e. you could sort out younger layers, often on top, vs older.) Then came various forms of radiometry, up to density of cosmic ray tracks in quartz crystals showing their formation age. When you have dates by these methods you can date recurrent features, whether geological (say, reversals of Earth magnetic field leaving fossil magnetic directions) or biological (dominant species of pollen or forams plankton mineral shells), and use them in turn for quantitative dating.